Published October 20, 2017 By Anna T. This post may contain affiliate links. Regardless, I only recommend sites I've researched and/or used and trust. FreeeUp is a company that puts skilled freelance workers together with clients who need their services. They place a strong emphasis on vetting the freelancers in their network, so that only those with the very best qualifications are accepted, and they use this focus on high-quality workers as a big selling point in their marketing pitch to prospective customers. The company is mainly targeting clients who may have had bad experiences hiring remote workers in the past, and want to avoid the lengthy process of finding and interviewing freelancers through the other big marketplaces, many of which have little or no vetting. With FreeeUp, everything is simplified. The client provides the information about the kind of job they need done, and FreeeUp assigns a worker with the right skill-set. Since all the freelancers working for FreeeUp are highly qualified with solid work records, clients can rest assured that they’re getting a responsible and skilled team member. The company also provides a powerful online interface for managing complex projects involving numerous remote workers. Clients can track and adjust the number of hours worked in a simplified way through the platform, and the interface allows them to view notes from all their remote team members in one convenient place. Once you’re accepted as a freelancer for FreeeUp, you’ll get access to a live-feed on the website with a constantly updated list of jobs that are a match for your abilities. You choose the job that seems most interesting or lucrative, and then indicate your interest by selecting it. Shortly afterward, FreeeUp will introduce you to the client through email, and there will often be a short interview between you and the client, using either Skype, an instant messaging service, or a telephone call. Additionally, as part of the basic training package, the company will provide you with some important material related to communication skills. They believe that communication issues are the biggest cause of problems between clients and workers in remote team situations, so they want freelancers who are good at dealing with clients on a person-to-person basis. The ultimate goal is to facilitate less stressful working relationships and a better client experience. The pay is extremely variable. You get to choose your own rate when you sign up—between a range of $5.00 and $50.00 per hour—and then you log time by punching in and punching out through an interface on the website. FreeeUp pays out to workers on a weekly basis with a one week delay. The money is sent through Paypal or Payoneer, and they take a 15% fee off the top of every transaction, with a minimum of $2.00. From what I can gather, it seems that scheduling is entirely dependent on the particular needs of each client. Some jobs might be rush orders, others might be long-term ongoing commitments, and some are quick tasks you can perform in an hour or so. You get to pick which jobs you want to apply for, based on whatever criteria you choose, so in that sense you have plenty of freedom to control your own work schedule. Anyone can apply. There are no rules or limits of any kind. But FreeeUp typically only selects the best of the best. They want people with at least a year of real world experience in their particular field, and top level professional skills. The company’s goal is to provide clients with a pool of diverse remote workers, skilled in many different areas, including content writers, advertising experts, personal assistants, web designers, graphic artists, and programmers. The list literally goes on and on, so if you have any sort of marketable skill that might be applicable to the E-Commerce industry, and if you’re very very good at what you do, there’s a chance they can find a place for you at FreeeUp. This really depends on what industry you work in. For example, if you’re a graphic designer, you’ll need a decent computer and access to all the typical graphics software—things like Photoshop, for instance. If you’re a content writer, you’ll need a decent word processing program. Basically, there are no specific requirements, but you’ll be expected to have all the tools needed to perform your job competently. Some clients may have specific tasks that would require you to purchase special software or gear, but it’s your choice whether or not to apply for those jobs. Getting accepted as a FreeeUp freelancer involves a fairly long and drawn out series of steps. To get started, you’ll need to fill out a very extensive online form, where you’ll provide all your personal information, tell them about yourself, detail your work history, and complete a few tests. If they’re impressed with your information, they’ll get back to you, and put you through a three phase interview process. The first interview focuses on your overall work history and your attitude. The second is a more advanced look at your particular set of skills. The third is basically a test to make sure you’ve studied their communication rules, and understand how best to conduct yourself when interacting with customers. If you make it through all the interviews without failing to meet their rigorous standards at any point along the way, you’ll be set up as a worker and given access to their marketplace. I checked the reviews for FreeeUp on Glassdoor.com. The overall opinion among freelancers who’ve been accepted into the program is overwhelmingly positive. Everyone seems to love the company. There were virtually no complaints to speak of, just a long list of glowing reviews. Many people loved the weekly payments, and the fact that FreeeUp sends an invoice to the clients themselves so you don’t have to deal with that part. Jobs are apparently available all the time, and people are getting good paying work from clients who are generally easy to deal with and professional. Many freelancers have been able to build positive long-term working relationships with clients through the company that’ve been extremely lucrative. 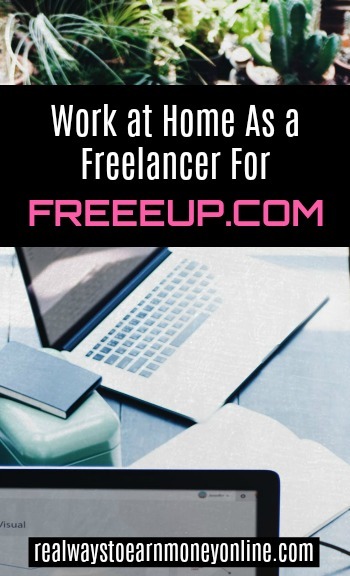 Overall, it sounds like FreeeUp’s marketplace is one of the better work-at-home employment opportunities out there for those who have the skill set and experience to get accepted. If you think you’ve got what it takes to become a Freelancer for FreeeUp, click here to go to their website and begin the application process. Just updated for 2019! Check out my e-book, How To Find REAL Work From Home Jobs. It lists 150 legit companies, specific instructions on finding work at home jobs yourself, and also many, many resources you can trust for searching/following.